This tutorial will show you how you can play MP3 files on your Dreamcast! 1. Download the DC-MP3 player zip file, and unzip into a new folder called "dc mp3" on your desktop. Make sure the "use folder names" box is ticked before extracting the files. The folder should now contain a WINCE folder, MP3 folder and dcmp3.exe, 1st_read.bin, cube, ip.bin files. 2. Find some MP3 files you want to listen to using your Dreamcast, and put them into your MP3 folder. You can download some Dreamcast game soundtrack MP3s from our Downloads section. 3. Copy all the files and folders in the "dc mp3" folder (don't copy the actual folder itself, just the unzipped contents) onto a blank CD. 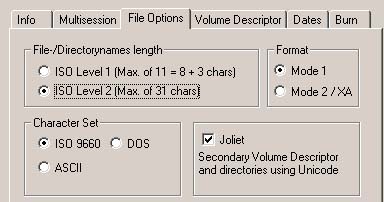 There are many CD copying programs out there, but make sure that you copy using the following settings: Mode 1, ISO Level 2, Joliet. I have used Nero, but as long as you stick to these 3 settings you can use any program out there. 4. Load a boot CD on your Dreamcast (click here if you haven't got a boot CD). Swap the CD with your newly made MP3 CD when prompted and away you go! You can navigate between the tracks with the up and down buttons, and play a track by pressing the A button on it. >> Post your questions or comments on our NEW FORUMS!